The San Pedro Square Market is hosting its 2nd Annual Wine Pour in late June, featuring a both large selection of unique wines and SJ MADE vendors. Pre-sale tickets are available right now! Scroll down for all of the details. Sample different wines while strolling through booths filled with unique creations made by San Jose artists. We will be closing down St. John street in order to provide a large selection of unique wines and vendors. Event is free to all ages. 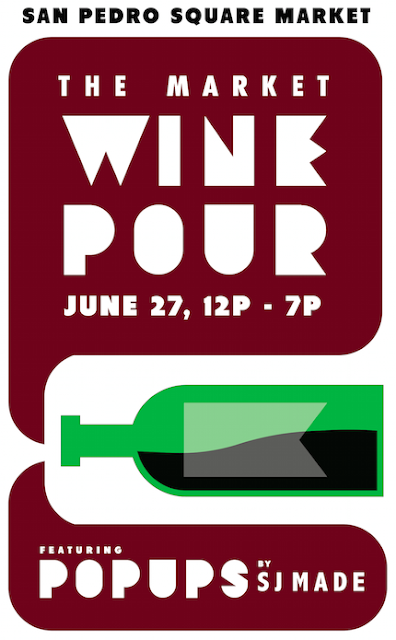 Wine Tasting begins at 1pm, check-in starting at 12pm. Come early and stay late to enjoy the SJMADE Vendor Faire from 12pm-7pm.